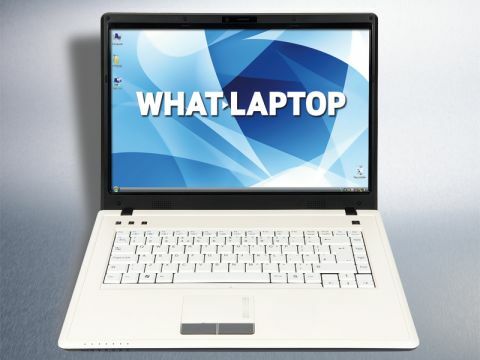 Does PC Nextday's laptop for the first-time buyer prove to be worthwhile? PC Nextday is a UK-based manufacturer and its Zoostorm range is its primary laptop brand. The Zoostorm Versa 81- 2200 (£349 inc. VAT) is one of its most affordable machines and, while it fails to match its rivals in terms of quality, it is still a good laptop for first-time buyers. The 2.6kg chassis is compact, but is not the lightest. It suits basic travel use and this is supported by its 190-minute battery life. This should safely take you through the daily commute. The combination of black and white plastics creates a starkly contrasting look that you'll love or hate. Build quality is strong, thanks to the tough plastics used. The white interior quickly attracts dirt, however, so you'll need to regularly clean the keyboard to keep it looking good. The keyboard has an unstylish design, but is very functional. All the keys move smoothly and respond well, so speed-typing is comfortable. The board is not as firmly attached as we'd have liked, however, and the keys rattle when typing. A standard 15.4-inch TFT screen is used here, as opposed the popular widescreen options. Images are sharp and bright, but colour and contrast lack definition, creating a hazy quality. The lid also only folds back 45 degrees from vertical, which makes it tricky to get a good viewing angle. Rather than the Intel Celeron processors that are so common, a more up-to-date Pentium chip has been used and is backed by 2048MB of memory. It fails to provide real processing power, however, so bear this in mind if you require maximum performance possible at this price. Graphics performance is even less capable. The SiS Mirage 3 GPU is one of the lowest-powered variants around and provides a third of the power of many other laptops. As a result, even the lightest 3D tasks struggle to run smoothly. More pleasing is the comprehensive storage on offer. The 250GB hard drive provides ample pace for a family to store their files. The dual-layer DVD rewriter lets you write up to 8.5GB of data to compatible discs and the 3-in-1 card reader allows you access to flash storage cards. An integrated camera, located above the screen, also adds extra usability for taking quick snapshots and recording live video. A slight disappointment of this laptop, however, is the Return to Base warranty, as you'll need to pay all related delivery fees in the event of a fault. While the Zoostorm Versa 81-2200 is not a bad laptop, it struggles to stand out against other laptops. It has plenty to offer to first-time buyers, but with no distinctive or defining points, it is quite a tough-sell.